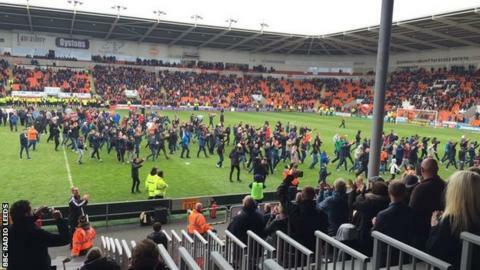 Blackpool's game with Huddersfield Town at Bloomfield Road was abandoned after 48 minutes following a pitch invasion by protesting home fans. With the score 0-0, hundreds of supporters came on to the field, forcing referee Mick Russell to take the players off the pitch. The game was held up for more than an hour before a decision was made to call the fixture off. It is not known if the match will be replayed at a later date. A Football League spokesman said: "Following the abandonment of today's match at Bloomfield Road, it will be for the Football Association to consider any matters relating to crowd behaviour, with the Football League ruling on whether or not the match should be replayed." Before the match, 2,000 Blackpool fans protested outside the ground against the club's owners, the Oyston family. The Seasiders have already been relegated from the Championship and have endured a miserable season, collecting just 25 points from their 45 games before Saturday's final match of the campaign. Saturday's protest was the second in just under a month at Bloomfield Road, after home fans threw fireworks and eggs during their draw against Reading. Shortly after half-time, Blackpool supporters made their way on to the pitch and headed towards the centre circle. Some fans released flares and began angrily chanting towards the Oyston family in the directors' area, as tensions rose inside the stadium. The scene soon became somewhat farcical, as one fan entered the pitch to join the protest on a mobility scooter, while others broke out in a conga line as supporters continued to voice their frustrations. Despite pleas from the referee to restart the match, the protesting fans stood firm and the match was eventually called off on safety grounds after over an hour of on-field protesting. Before the game was abandoned, the visitors were twice denied an opening goal as Joe Lolley and former Blackpool striker Ishmael Miller had their efforts stopped by Elliot Parish. Parish was called into action again shortly afterwards to deny Oscar Gobern's well-directed header, before Peter Clarke's long-range shot nearly gave the home side the lead against the run of play. Jamie O'Hara forced a save from visiting goalkeeper Alex Smithies before the pitch invasion ended the match. Blackpool manager Lee Clark: "It just compounds an absolutely horrendous season. The supporters were just acting on this season and the culmination of the relegation. "Frustration has been building up over a period of time. It's a very, very disappointing day. I love football and I love working in the industry ever since I left school, and I didn't want to be involved in anything like this. "I have the feelings of a supporter and I'll never criticise them. Since I came through the door there has been a very toxic atmosphere and you can't be successful with that. "We kept chatting to the referee and the officials and match commander, but we couldn't determine what was going to happen or how long we'd have to wait before it was abandoned and what would the sanction be. "Is the game going to be replayed? No-one knows as it's a unique situation." Huddersfield manager Chris Powell: "I feel sorry for our fans first off, coming all this way. I'm sure some will have come last night and paid for accommodation and they were all in a good mood. "To be fair to the referee, he was a little bit in shock but handled it well and got advice from safety officers and the head of police. They tried their best to get the game back on but in the end they couldn't guarantee our safety. "It's strange to end the season this way. There's talk of replaying it but half my team go away on Tuesday so I really don't know what is going to happen. I don't know how they are going to do it." Match ends, Blackpool 0, Huddersfield Town 0. Second Half ends, Blackpool 0, Huddersfield Town 0. Hand ball by Darren O'Dea (Blackpool). Corner, Blackpool. Conceded by Alex Smithies. Attempt saved. Jamie O'Hara (Blackpool) right footed shot from outside the box is saved in the bottom left corner. Assisted by Nathan Delfouneso. Second Half begins Blackpool 0, Huddersfield Town 0. First Half ends, Blackpool 0, Huddersfield Town 0. Offside, Huddersfield Town. Jacob Butterfield tries a through ball, but James Vaughan is caught offside. Peter Clarke (Blackpool) is shown the yellow card for a bad foul. Offside, Huddersfield Town. Tommy Smith tries a through ball, but Joe Lolley is caught offside. Attempt saved. Charles Dunne (Blackpool) right footed shot from outside the box is saved in the centre of the goal. Offside, Huddersfield Town. Joe Lolley tries a through ball, but Ishmael Miller is caught offside. Corner, Huddersfield Town. Conceded by Peter Clarke. Attempt missed. Peter Clarke (Blackpool) header from the centre of the box is close, but misses the top right corner. Assisted by Jamie O'Hara with a cross following a corner. Attempt saved. Peter Clarke (Blackpool) right footed shot from outside the box is saved in the top centre of the goal. Assisted by Jamie O'Hara. Attempt missed. Ishmael Miller (Huddersfield Town) left footed shot from outside the box is too high. Assisted by Tommy Smith. Darren O'Dea (Blackpool) is shown the yellow card for a bad foul. Jamie O'Hara (Blackpool) wins a free kick in the defensive half. Corner, Huddersfield Town. Conceded by José Cubero. Attempt blocked. Dominic Telford (Blackpool) left footed shot from outside the box is blocked. Attempt missed. Joel Lynch (Huddersfield Town) header from the left side of the six yard box is close, but misses to the right. Assisted by Jacob Butterfield with a cross following a corner. Corner, Huddersfield Town. Conceded by Elliot Parish. Attempt saved. Oscar Gobern (Huddersfield Town) right footed shot from outside the box is saved in the top left corner. Assisted by Reece James. Substitution, Blackpool. Henry Cameron replaces Niall Maher. Attempt saved. Ishmael Miller (Huddersfield Town) left footed shot from the centre of the box is saved in the centre of the goal. Attempt saved. Joe Lolley (Huddersfield Town) left footed shot from the centre of the box is saved in the centre of the goal. Assisted by James Vaughan. Attempt blocked. Dominic Telford (Blackpool) left footed shot from the right side of the box is blocked. Assisted by Niall Maher.